Whey is a byproduct of dairy processing, used in making cheese and yogurt. And it's used to make the coating found on many processed foods, including crackers. As with any animal product, it can be contaminated with germs, including salmonella. "We believe these products may contain a common whey ingredient supplied by Associated Milk Producers Inc., that may have been contaminated with salmonella," FDA Commissioner Dr. Scott Gottlieb said in a statement. "As there are likely other food products made by other manufacturers that also use this common ingredient, there may be other recalls initiated in the coming days. We are also aware that our partners at the U.S. Department of Agriculture are working with Pinnacle Foods Inc. on a public health alert regarding certain Hungry Man products that may also contain this ingredient." Germs can get into just about any product and cooking doesn’t always kill them. In 2016, uncooked flour caused an outbreak of E. coli infections. Right now, the CDC and the FDA are cautioning people about salmonella in raw turkey products, packaged pasta salad, crackers and breakfast cereal. Last month, an outbreak linked to cut melon made 70 people sick in seven states. An outbreak of salmonella traced to Honey Smacks cereal has sickened 100 people in 33 states. Salmonella can be very hard to kill, said Henk den Bakker of the University of Georgia's Center for Food Safety. "We know it's very persistent and it can persist in dry foods," den Bakker told NBC News. Whey products are heat-treated, but contamination can occur at multiple steps. "It can be in the machinery that’s used to produce the whey. It can be in the containers," den Bakker said. Consumers are told to throw away all foods affected in a recall because it’s impossible to tell that a product has been contaminated by looking at it. 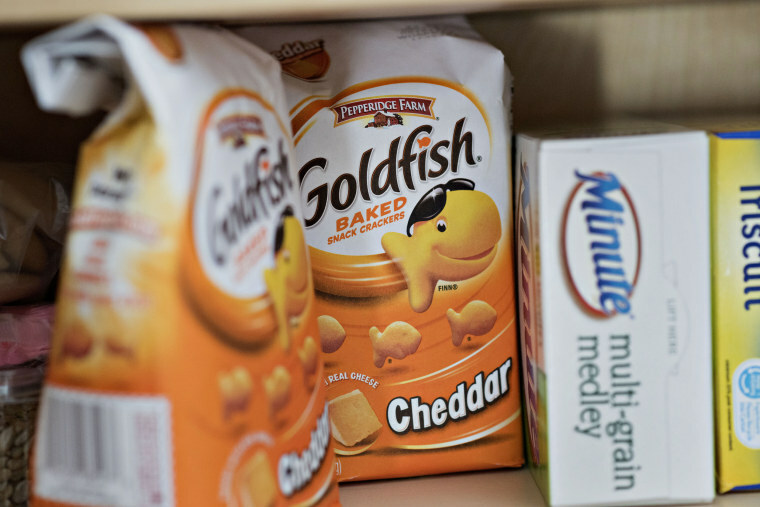 The recall linked to the dried whey is affecting certain Goldfish products — not all — as well as certain Ritz Bits and Ritz cracker sandwiches. It’s also affected a few bread products: Mrs. Freshley’s, Food Lion, H-E-B supermarket, Baker’s Treat, Market Square, Great Value and Captain John Derst’s Old Fashioned Bread, the FDA said. “Consumers who have these products should not eat them, and should discard any products they may have,” the FDA said. Salmonella is usually not serious. Most people infected develop diarrhea, fever and abdominal cramps 12 to 72 hours after infection. The illness usually lasts four to seven days, and most people recover without treatment, the CDC says. “However, in some persons, the diarrhea may be so severe that the patient needs to be hospitalized,” the CDC says. Despite all the recalls, den Bakker said the U.S. food supply is very safe. "I think the reason we have so many recalls is we are getting better at detecting them," he said. "We have a network of public health labs that monitor outbreaks."